If a Hyundai Elantra sedan doesn’t tickle your fancy and compact hatchbacks are more your thing, then don’t confuse the Elantra GT as merely a ‘hatched’ version of the same humdrum sedan you may have overlooked. Based on the European I30 it rides on a shorter wheelbase and features different suspension. It forms the basis for a hot Golf GTI fighter overseas too, so there must be merit under the metalwork, and for 2019 Hyundai has revised the Elantra GT line-up to feature a new lukewarm model called the Elantra GT N-Line to replace the old GT Sport. The compact hatchback market is now going to be a lot more exciting against the usual suspects of the VW Golf, Ford Focus et al. With two engines, a 161 horsepower 2.0-liter and a 201 hp turbo 1.6-liter, and priced from $20,450 to $24,400 the Korean firm is intent on making you compact hatch decision a little trickier. The Hyundai Elantra GT is more than just a hatchback version of the Elantra compact sedan. Based on the European i30 it’s had extensive development to enable it to form the base of the hot i30 N, making this Hyundai’s Golf rival with equal performance potential. 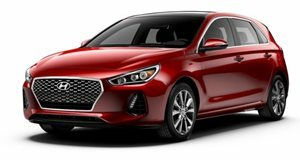 Priced between $20,450 and $24,400, the 2019 Elantra GT features two engine choices - a base 2.0-liter worth 161 horsepower and a turbo 1.6-liter developing 201 hp - with three gearbox choices available. There’s also a range of advanced safety features and convenience features with an available Technology Package on the Elantra GT N Line incorporating features like wireless charging and an eight-inch navigation system. But the big news for the 2019 model year Elantra GT is the addition of a new N Line trim in place of the old GT Sport. 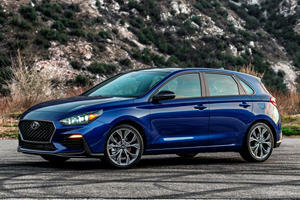 New suspension and steering tuning, upgraded brakes, and a stiffer chassis finally give the Elantra GT a hint of the performance potential available, with Hyundai desperately attempting to change perceptions around the brand and establishing them as a true Ford and Volkswagen rival in all aspects. The Elantra GT’s 104.3-inch wheelbase is two inches shorter than the sedan that shares the Elantra nameplate. But that badge is where the similarities end, as the two models are styled entirely differently. The front end of the Elantra GT features Hyundai’s hexagonal cascading grille design mounted low on its face flanked on either side by faux air inlets with built-in lights. Above each of these openings are drawn back three-projector design headlamps with standard LED daytime running lights. Full LED headlights are standard on the GT N Line. On the N Line, a new lower front spoiler improves aerodynamic efficiency and puts the GT lower to the ground,while the grille is also adapted for the N Line derivative to increase air flow and give sportier aesthetics with a silver character line. A pronounced shoulder line runs the length of the Elantra GT, stretching back from the corner of the headlights to the taillights. 16-inch alloy wheels are the default wheel choice on the base GT, while the GT N Line gets 18-inch N Line exclusive wheels shod in Michelin Pilot Sport 4 summer tires. The N Line also trades out body colored mirrors for blacked out items housing turn signals. At the rear of the Elantra GT, a black windscreen surround features an integrated roof mounted spoiler. The rear windscreen occupies a third of the vertical profile, with available LED tail lights positioned just below being relatively nondescript in shape compared to rivals from the likes of Ford. The load-sill of the tailgate sits low on the rear end, with the license plate mounted beneath this and a blacked out lower bumper housing dual chrome tailpipes mounted wide at the rear. The N Line gets N Line badging at the rear and a revised lower bumper with more aggressive aerodynamic profiling and side blades extending upwards along the outer edges. Hyundai offers two engine derivatives for 2019 in the Elantra GT, both of which carry over from the 2018 model. The base Elantra GT features a 2.0-liter naturally aspirated four-cylinder engine developing 161 horsepower and 150 lb-ft of torque, making the GT more powerful than the Elantra sedan. But like the sedan, the Elantra GT remains solely front-wheel drive. In the Elantra GT, power is routed to the front end via a standard six-speed automatic gearbox, with the six-speed manual previously available being dropped for the 2019 model. With boosted outputs compared to the sedan, the base engine is more usable, but the automatic transmission still dulls responses and overall performance is tepid compared to the turbocharged Volkswagen Golf. Economy is decent but below the estimates of turbocharged rivals, with claimed estimates of 25/32/27 mpg city/highway/combined compared to 29/37/32 mpg from the Golf 1.4T. Still, with mixed city and highway driving, the Elantra GT will give buyers an estimated 378 miles range on a 14-gallon fuel tank. It’s the higher output engine derivative that might entice more than a few buyers, with the new Elantra GT N Line boasting a carryover 1.6-liter turbo four-cylinder from the previous GT Sport. In the new N Line it still develops 201 hp with 195 lb-ft, but benefits from a choice of two different gearbox options. A six-speed manual is standard for those who prefer rowing their own gears, and while the engagement is appreciated, the motor suffers from some turbo-lag that is more efficiently dealt with by the optional seven-speed dual-clutch automatic Shiftronic gearbox. The extra performance the 1.6T grants is most welcome, and with revisions to the chassis the N Line now treads on proper hot hatch territory. It comes with a compromise, and even the most efficient of the two gearboxes, the seven-speed dual-clutch auto, only grants economy estimates of 26/32/28 mpg, giving a range of only 392-miles on the 14-gallon tank with combined driving and gentle use of the throttle. It’s not just the exterior of the Elantra GT that differs from the sedan, it boasts a different interior as well, and one that is extremely well appointed and feels of an extremely high quality. Normally a failing of compact hatchbacks, the Elantra’s door openings are tall and fairly easy to climb in and out of, providing good head clearance and a low step-in height. But they’re narrow - a limitation of a compact wheelbase - so you have to retract your legs rather than being able to swing in and out with ease. Once inside, the driver’s seat offers a wide range of adjustment including standard six-way manual adjustment (optional power adjustment) with height adjustment making it a comfortable perch for drivers of all heights. The driver seat bottom cushion boasts adjustable angle as well which is an added bonus. Once in a comfortable position, the steering column tilts and telescopes a fair amount enabling decent reach regardless of the seat’s distance from the wheel. The seats are decently comfortable and offer more support and bolstering than the standard items on the Elantra sedan, while the standard cloth upholstery feels high quality. Leather seating surfaces are standard on the Elantra GT N Line. While the front seats offer a spacious environment, the reduction in wheelbase compromises rear passenger legroom that’s tighter than in the Golf and the Honda Civic. Headroom is also surprisingly cramped despite the roofline not appearing to slope too much from the outside. Two adults can fit in the back seat, but if you’re taller than six foot you’ll likely be a little uncomfortable on anything more than a short journey. The interior is relatively simple in its layout, easy to learn and operate without much trouble. But it’s not a bad thing, the simplicity, as the ergonomics are all on point. A standard eight-inch touchscreen infotainment system bears some redundancies with various hard buttons on the dash shortcutting to the different menus, which makes it easy to get around the system. Android Auto and Apple CarPlay are standard, as are six speakers, AM/FM/SiriusXM satellite radio/HD Radio capabilities. On the standard Elantra GT, interior comforts include manual air conditioning and cloth upholstery, while optional dual-zone climate control and automatic temperature control are standard on the N Line derivative. On the new N Line, an optional package equips an advanced AVN 5.0 infotainment system with a faster processor and built-in navigation. The technology package also equips a seven-speaker Infinity sound system, Blue Link Connected Car System, Clari-Fi Music Restoration Technology, and a QI wireless charging pad for capable devices. The N-Line also boasts ventilated leather sport seats with power adjustment and lumbar support, a panoramic sunroof, an auto-dimming rear-view mirror, and a range of safety features. Hatchbacks offer more cargo space than their sedan counterparts, and the Elantra GT is a clear example of this. The deep trunk in the GT maximizes cargo volume, but comes at the compromise of more difficult loading with the steep lip into the load bay. But, there’s an available 24.9 cubic feet of cargo volume in there, which is great for the segment and caters for more than a week’s groceries or two large suitcases with ease. The rear hatch opens high as well, so it’s easy to try and get oddly shaped objects inside. The rear bench folds in a 60/40 split to enhance storage space, giving a final capacity of up to 55.1 cubic feet. While the figure might suggest cavernous volumes, the low trunk floor means the seats don’t lie flat with the floor, making the space less usable than the numbers might suggest. The rest of the cabin offers ample storage space as well, with a good variety of differently sized storage options. The front cupholders have an anti-tip design, and the door pockets will comfortably fit an average size water bottle with other items. The console bin is large enough to house most modern smartphones, with means to charge them. The center armrest and accompanying storage underneath it are small, but useful for smaller items like house keys. Unlike the Elantra sedan, the Hyundai Elantra GT isn’t overly comfort biased and is enjoyable to drive. The ride is on the firmer side of things, but the suspension does a good job of keeping out every bump and bruise for a ride that’s firm but not harsh. There’s a good balance between keeping things controlled and in with the road and compliance over large bumps, with the suspension controlling body motions in a way that rewards those who enjoy driving and like to explore the limits of the chassis. Low rolling resistance tires on the base 2.0 Elantra GT don’t offer huge amounts of grip, but there’s enough to exploit, largely due to the good suspension tune. Even in base trim, where the rear suspension is a torsion axle with coil springs, sharp bumps fail to unsettle the rear. The step up to the N Line is where sporting credentials become a little stronger though as the suspension is upgraded to a multi-link independent rear setup. While last year’s GT Sport offered improved performance from this ugade alone, for 2019 the change to N Line also brings with it increased levels of stiffness and a revised suspension tune. The springs have been made 14.3% stiffer up front and 21.9% stiffer at the rear, while the shocks have been tuned differently as well. While this makes the N Line less forgiving and comfort biased than the standard GT, it does give it real hot-hatch credentials. Furthermore, the N Line gets Michelin Pilot Sport 4 summer tires on the manual-equipped model, offering higher levels of mechanical grip and giving it a performance advantage over the dual-clutch automatic-equipped derivative. The steering is highly impressive, despite being an electronically power-assisted system. The system responds well to inputs with direct responses and sharp turn-in, and decent weighting that feels secure at speed. It lacks in feedback, a regular criticism of electronically power-assisted systems, but something that puts it about on par with most competitors in this regard. On all other metrics, the steering is impressive. The N Line also receives an update to the steering tune, set to make it more responsive and hopefully offer better feedback. The brakes on the base GT are decent, providing sufficient stopping power with great pedal modulation and a natural feel. Larger front and rear brake rotors on the Elantra GT N Line give it improved stopping power, with better resistance to fade under duress. 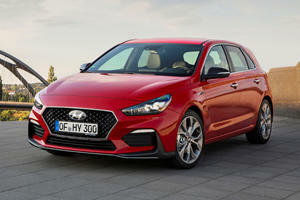 Overall, the Hyundai Elantra GT is an enjoyable compact hatchback to drive, with the N Line stepping things up to take Hyundai into true hot hatch territory. It’s not up to the same standard as the Veloster N, a full-fat performance model, but it’s more enticing to drive spiritedly than the VW Golf or Toyota Corolla hatch might be. Overall, the build quality of the Elantra GT feels strong, with most of the dash materials soft-touch in nature, and those that aren’t are devoid of rattles. The only flimsy feeling controls are those for the side mirrors, whose switches feel cheap and tacky. There has only been one recall for this generation Elantra GT, for the 2018 model, on which the sunroof sometimes failed to detect resistance upon closing, which could potentially cause injury to any body parts protruding from it. Not many problems have been reported with the Elantra GT, and while 2019 results haven’t yet been established at the time of writing, the 2018 Elantra GT scored a predicted reliability rating of 4 out of 5. The average industry score is 3 out of 5, however several rivals in this class also score 4 out of 5. As with all Hyundai products, the comprehensive 10-year/100,000-mile powertrain warranty gives buyers huge confidence, while a 5-year/60,000-mile limited warranty is better than some in the segment. As before, two trims are available for the 2019 Hyundai Elantra GT. The base Elantra GT is powered by a 161 horsepower 2.0-liter engine mated to a six-speed automatic transmission as its only gearbox option. With a base price of $20,450 for the 2019 model year, standard equipment includes cloth upholstery, six-way driver seat adjustment, rearview camera with dynamic parking guidelines, an eight-inch touchscreen infotainment system with Android Auto and Apple CarPlay functionality, AM/FM/HD Radio/SiriusXM satellite radio capability, and air conditioning. Optional extras include dual-zone climate control with automatic temperature control, a leather steering wheel, leather seating surfaces, heated front seats, a panoramic sunroof, and a sliding front armrest. Standard safety features include stability control, ABS braking, hill start control and vehicle stability management, while buyers have the option of lane change assist and blind spot collision warning with rear cross-traffic alert. The full details of the 2019 Elantra GT are yet to be published, so options packages are not yet confirmed. The Elantra GT N Line is priced from $23,300 in manual guise and comes equipped with the more powerful, 201-hp 1.6-liter turbocharged engine and a six-speed manual gearbox. The N Line adds sportier exterior styling cues, including 18-inch alloy wheels, an N Line grille and bumpers and blacked-out side mirrors, while the interior gets a flat-bottomed, perforated leather N steering wheel, N Line leather sport seats, a sporty instrument cluster, and contrast red stitching throughout. Standard features include full LED headlights with automatic headlight control, heated side mirrors, and automatic dual-zone climate control. The manual version also gets high-performance Michelin Pilot Sport 4 high performance summer tires. Standard safety features are the same as the base GT. The automatic N Line, featuring a seven-speed dual-clutch automatic gearbox, costs $1,100 more, but does without the performance summer tires. An optional Technology package for the N Line adds a range of comfort features including a faster eight-inch infotainment system with built-in navigation, a panoramic sunroof, Blue Link Connected Car system, ventilated seats, power adjustment on the driver’s seat with lumbar support, a premium Infinity sound system with seven speakers, wireless charging pad, while safety is also bolstered by smart cruise control, forward collision avoidance, high-beam assist, lane keep assist, driver attention warning, and an auto-dimming rearview mirror with BlueLink and HomeLink. Heated seats are also optionally available. In stark contrast to the Elantra sedan, the Elantra GT Line is a firm-riding hatchback with sporty pretense. The base model is well equipped, but the naturally aspirated motor and automatic gearbox combination is dull and lacks proper performance potential. The new-for-2019 N Line not only ups performance with a 201-horsepower 1.6-liter turbo motor, but gives buyers a standard manual gearbox, hotter performance, and performance summer tires to keep things sticky. The stiffer chassis and revised suspension and steering take influence from the European i30 N hot-hatch, and the available technology, both standard and optional make it a really enticing proposition. It’s a great performance derivative at a discount price versus full-on hot hatches like the Golf GTI and Ford Focus ST, and two years into the new model it’s looking better than ever. Say goodbye to the old GT Sport. 'N' sounds cooler. Is Hyundai testing the water for an Elantra N model?